Ahna and The Red Ducky…My First Video! As I promised you…here are more images from our trip to Indiana, when we visited Miss Ahna. Here, are a few adorable pics from her getting a bath. Look real closely and you will see, her ducky is not just an ordinary duck. 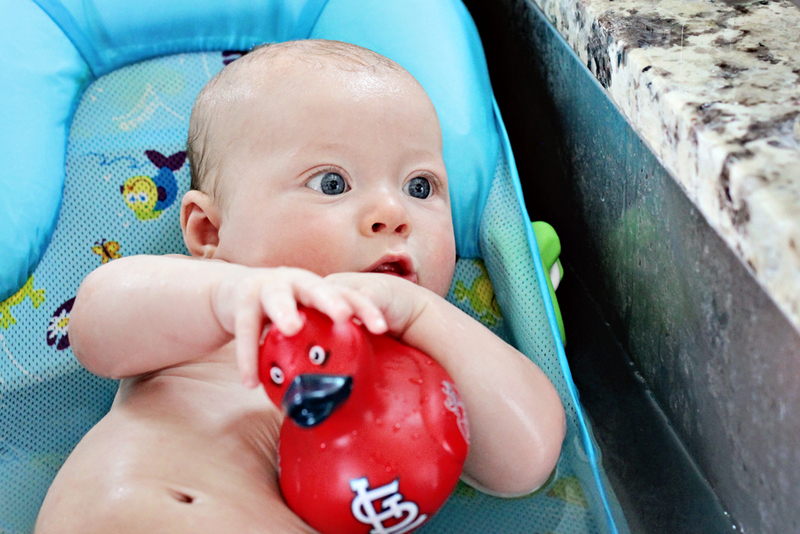 It is a St. Louis Cardinals Duck…for all you Cardinal fans out there! I have decided to start offering videos as part of the Pride in Photos Photography package! I have read that Facebook will mostly be all video content in five years! This is the wave of the future the professionals are telling us. I love using my family as the models until I get the new project just right…smile. Not a lot of family photographers are offering this option at this time. It will be a special edition to the photography collections that I think the clients will just love. Click on the image above to view my first video. I would love to hear your comments on this creative endeavor. Is there something you love or something you would like to see different? Waiting for your lovely thoughts…. Just lovely and the music choice is perfect. How very sweet! Those great big beautiful blue eyes certainly are a family trait! I almost missed this one… Love the video, I watched three times, she is beautiful! 🙂 Thank you for sharing the beautiful and precious moments! Thank you Amy…I thought it was precious too. Baby baths in the sink are the best. They didn’t have those seats back when my kids were babies. I would put a towel in the sink – sit them on it & hold them with one hand/arm while I bathed them with the other. What a perfect moment with mom captured! So sweet. excellent shots Laurie. She is a beauty and what a fun video! Definitely a treasure. How cute is this baby? Loved your photographs, they definitely capture the beauty of youth! Family models are the best, aren’t they? Everybody wants videos these days so I think you will be going with the trend to have a video to go with photos. She is adorable! Thanks for the recent visit to my blog! Have a good week! Is this Little Man’s sister? if not, they sure do have the same eyes! What a sweetie Ahna is! No, they are cousins…big eyes run in the family. Oh what a sweetheart. And I loved the video, just precious. Love her big blue eyes and long lashes and that sweet, sweet smile!! How adorable (I want to Nana nibble those little toesies) and I need a duck like that!!!! Where did they get it? It was a gift to them from another St. Louis Fan. Love the video and Ahna is a beautiful baby. I agree those eyes are so beautiful. Loved the picture of her and mommy! She is just adorable! And look at those eyes! How old was she when you took those pictures? She is beautiful. She was four months old. Only about 3 weeks ago. She is so precious with those eyes! !